The Czech Republic has a surprisingly well-organized public transport system. It was named the 4th best system in Europe by the FIA in 2010, following Helsinki, Munich and Vienna. There is nothing to fear from Prague transport, quite the opposite. Enjoy a venture into the underground labyrinth of Prague’s metro (one of the deepest and most modern in Europe) or hop on a tram - the iconic vehicle that defines the streets of the Czech capital. When traveling to Prague, also consider its traffic jams. The city suffers considerably due to its historic narrow streets as well as the many construction projects that can make traffic tie-ups quite unpredictable. Many Praguers use their cars exclusively to travel to the countryside on weekends and wouldn’t even consider driving downtown. Metros and trams are the most efficient, fastest and most environmentally friendly choice. Taxis are a good option to save yourself the hassle with luggage upon arrival or if you get tired at night. Other than that, public transport is your best bet. The longest waiting time for a metro is about 10 minutes (late evenings, weekends and national holidays), but at peak times they arrive literally every minute or two. The same is true for the busiest tram lines that weave through the center. Buses downtown are considered only supplementary during temporary tram re-routings, so they may not go as often. The first subway leaves from the end of each line every day at 4:45 in the morning. At night, the last metro departs its depo station at midnight, so you can still catch it from downtown a little after midnight. Same with trams. After that, the system switches to night-trams and buses running approximately every 10-20 minutes. At the stops, they are shown in the schedules as white-on-black, as opposed to the daytime black-on-white timesheets. The night-tram routes have their own numbers, but generally copy similar routes as those during the day. All night-trams cross one another at the Lazarská crossing, so you can always switch a route there. Each tram or bus stop shows a schedule that you can expect to be precise and unless something unusual occurs, you can set your watch by it. Stops along the entire route are shown on the schedule, with your current stop highlighted. The following stops are below your current stop and have a number next to them, indicating how many minutes it will take to get there. This may be important if you have a time-limited ticket. It’s also the best way to make sure you’re not going the wrong direction, in which case simply cross over to the opposite side. As with all public places with crowds, public transport is an easy target for pickpockets. The Czech Republic is generally very safe, with personal crime almost non-existent, but property crime is considerable. Watch your belongings carefully. We recommend wearing purses across your body and sliding them in front of you as you approach crowded areas. Don’t keep your backpack on your back – it’s both inconsiderate to fellow passengers and a target for pickpockets. Don’t put your wallet or phone in your back pocket or loose coat. Make no mistake: the Czech Republic is one of the safest countries worldwide, but a confused tourist is an easy target. It’s a customary courtesy for younger riders to give their seats to the elderly, disabled, pregnant or mothers with little children. This is particularly true near the doors, where some seats are actually but not exclusively assigned for it. Just because you feel tired yourself, it doesn’t mean it’s your seat. The unspoken rule is that if someone has gray hair, they should sit. If you happen to have gray hair and someone offers their seat, please acknowledge and accept it. We hope to keep this custom alive and younger generations are often less attentive. If you are not accustomed to riding on public transport, you may be surprised by sudden braking. The trick is to stabilize your position as soon as you board the vehicle – stand as if you would look out a window, place your feet slightly apart and hold on to one of the many handles, straps or bars. If you wish to talk to your companion, still keep your feet in that position and just turn your upper body to face them. This may sound silly, but we’ve picked many a tourist off the floor, just because the driver had to hit the brakes. On public transport, a little awareness goes a long way. Even if you’re tired or excited from your sightseeing, pay attention – to yourself, your belongings, your luggage and other passengers. A Ticket or a Pass? In Prague, you use the same ticket or pass for all types of transportation - metro, trams or buses. You can also switch between them with that same ticket, as long as you fit into the time limit you purchased. Tickets or passes must be bought ahead of boarding buses and trams or entering the metro platforms and are not available on board. Most Praguers carry a monthly or annual pass, so you won’t see them buying or marking any tickets, which can be confusing to tourists because there is a yellow ticket-timer on board. On metros, a ticket must be purchased before entering the second escalators (from the vestibule to the platform), because you may be checked at any point beyond the metal barriers. Prague doesn’t offer a bulk discount on tickets, but if you are staying for a while, it’s best to get a pass for a specific time-period. It will make you think differently about our public transport, because you won’t hesitate to just catch a tram for a stop or two to save your legs. With a valid pass you can go anytime and anywhere - on a metro, bus or a tram. No worries. Tickets are distinguished by only two criteria: the duration of their validity and the child / adult category. However, when you find yourself dealing with a distributor who offers a dozen different tickets, and where everything is written exclusively in Czech, you may well feel a little lost. Don’t forget to validate your ticket the first time you board a tram or bus or enter a subway station by entering it to the orange timestamp machine at the top of the stairs or escalator. Merely having a ticket in your pocket is not sufficient. After a split second, you will hear a beep, and the machine will print the date and time on your ticket and you then have 30 or 90 minutes to use public transport. You may change as many times as you wish (you can of course combine the different means of transport: from tram to metro, subway to bus, etc.). You never stamp the same ticket twice, even if you are changing to another mode of transportation. The important thing to remember is the 30/90 minutes for which your ticket is valid! Which Public Transport Pass Should You Purchase? 1-day passes are available from vending machines located at stops and in metro stations – prepare sufficient amount in coins and locate the button with the appropriate price. For a longer stay, consider a transferrable (any holder can use it) 1-month pass for 670 CZK, which does not require any ID or registration. Passes for 3 days and longer are only available from the official information centers of the Prague public transport service (see below). To validate your pass, simply use the timestamp machine as for a regular ticket that prints the date and hour on it. Then forget any further stamping for a month. That’s it, you’re done. Always keep it with you when using public transport. Never re-stamp a monthly pass or any other ticket, as that would make it unreadable and invalid! The only time you will need it again is in case you are subject to a random check. Controllers (typically down on metro platforms or unexpectedly on a tram or bus) will show you a badge and ask to see your ticket or pass. They are not uniformed (so as to blend in with riders) but tend to speak English. In English or not, you will know what they want by their badge and simply show them your pass. Where to Buy Tickets and Passes? Tip: Even if you are catching a taxi from the airport, you may first want to get your public transport pass and then stamp it later, once you need it. 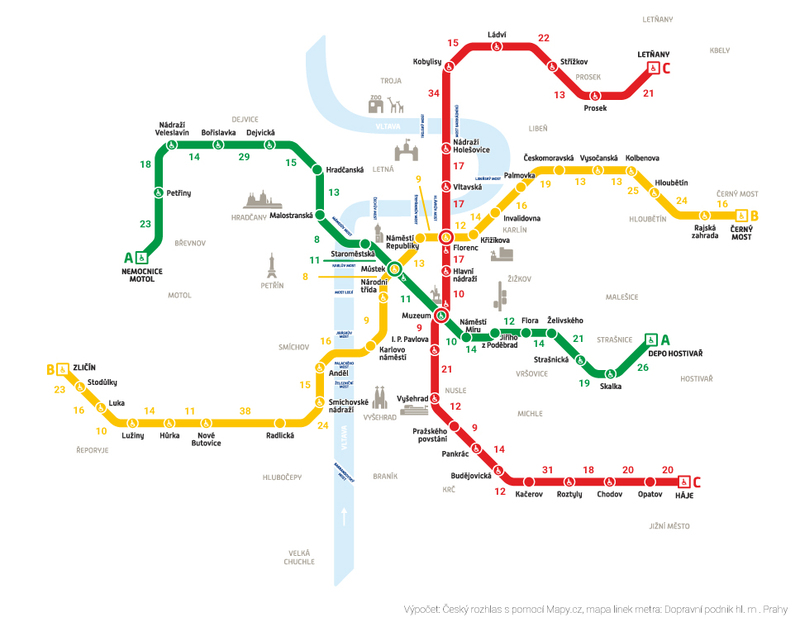 Lines: Prague has three metro lines: green (A), yellow (B) and red (C). Metro stations are modern, clean and offer excellent levels of security. To view the Prague metro map, click here! For decades, the old and now modern red trams were an integral part of Prague cityscape (and feature seats are heated in winter). Traveling by tram allows you to see the most of the streetscape; however, no Prague tramway follows a circular route: they all cross the city with endpoints from which they reverse. Karlovo náměstí stop - Charles Square (New Town), to see the "Dancing House"
Click below to go to a website that offers an instant search for your Prague route: just enter the departure stop, arrival stop, date and time. The site is in English. How do you know what your stop is, and what its name is in Czech? It's easy: find it and copy its name from the Google maps site; metro stops are marked with a blue "M" and tram stops by a small blue tram. Airport transfers in Prague by taxi are not likely to break your budget and may save you some hassle. If you are arriving after a long flight, being greeted with a sign in the Arrivals terminal might be just the thing - a sense of luxury and comfort, especially if you have a lot of luggage. That said, public transport to and from the airport is convenient and it costs next to nothing. A 17-minute ride in on the 119 bus takes you to the brand-new metro stop Nádraží Veleslavín, where you can catch Green line (A) of the Metro arriving downtown in about 15 minutes. Our genius architects failed to build an escalator from the bus down to the metro vestibule. So, in the one station where all tourists are carrying heavy luggage, you are required to take the steps. But, if you glance across the bus terminal, you will notice a glass booth with an elevator for the disabled and baby carriages – feel free to use it. If you are traveling with a large suitcase, consider an additional 16 CZK ticket to save yourself hassle in case you get randomly checked! the penultimate stop, Letiště Václava Havla (Terminál 1), is intended for flights to countries outside the Schengen area: United Kingdom, United States, Australia, Asia countries etc. the last stop, Letiště Václava Havla (Terminál 2), is intended for flights to countries in the Schengen area: France, Germany, Holland, Switzerland etc. After some research on the Internet or in the guide books, one would think that Prague is a dangerous jungle where it is better to avoid taking a taxi if you don’t want to be a scammed. It’s true that this bad reputation is not without foundation, but it ended up making the dimensions a bit exaggerated. Just a few simple steps should keep the problem from arising. Remember that there are many honest drivers in Prague who work for reliable companies! Bear in mind that the local currency is the crown and taxi drivers are not obliged to accept foreign currency and if they do, they will convert your amount with an exchange rate that will likely be unfavorable for you. If the situation allows, order your taxi by phone, if possible through your hotel or guide. Taxi (guaranteed by the municipality), typically near Metro stations or busy transit areas. Take only those taxis whose rates are displayed on the doors of the vehicle. Before you start out, agree on a maximum price of the trip and check that the driver starts his meter. Ask for a printed receipt before you leave the vehicle and, if in doubt, copy down the driver's name and license number.